Tirupati Balaji Temple, where Lord Venkateswara is worshipped, is situated at the Tirumala hills in the Chittoor district of Andhra Pradesh. It is the most visited religious site in India. Tirumala stands for the holy forest and it has seven hills. The Tirupati Balaji Temple is built on the seventh hill. 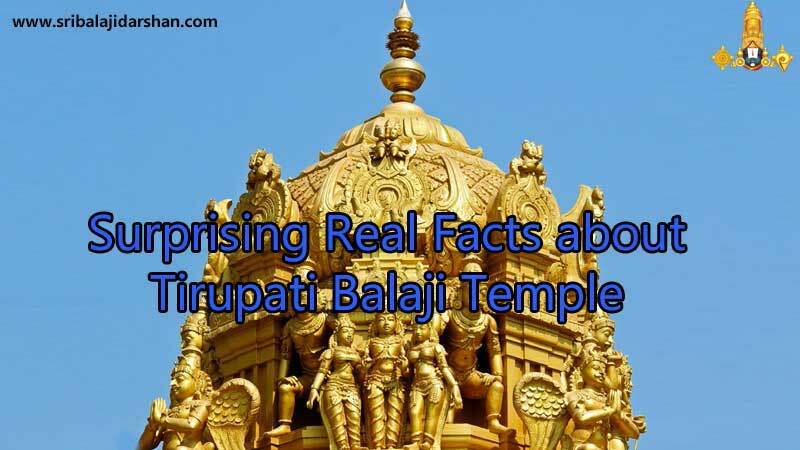 Here are some surprising real facts about Tirupati Balaji Temple that will make you want to visit the temple soon! If you carefully keep your ear and listen against Swamy’s back, the sound of an ocean is heard. A waterfall near the temple is considered a probable reason for this. But nobody knows the real reason. One of the most shocking and incredible fact that anyone could believe is the Tirumala Hills that is located 1 km north of the temple is a natural arch and which resembles the facial structure of Lord Tirupati Balaji itself which is also known as Silathoranam. The idol of Lord Venkateswara appears to be kept exactly in the center of the Garbhagriha to a devotee standing inside, but actually, the statue is placed in the right side corner of the Garbhagriha of the temple. This can be noticed from standing outside. As per the story of Lord Balaji, a stick used by Ananthalwar to hit Venkateswara Swami when he was a child, his chin was hurt. Since then, the tradition of applying Sandalwood paste on Swamy’s chin began. This stick remains preserved until today and is kept on the right-hand side of the temple entrance. Pachai Karpooram, a green-colored camphor, has the ability to crack any stone, But not so in Lord Balaji’s case. No one knows what the reason behind it. No matter how many times, the back of Swamy is dried, it remains moist always. The statue of Lord Balaji has a temperature of 110 degrees Fahrenheit despite the temple being located at a height of 3000 feet. The idol is often reported to show droplets of water which are believed to be the sweat of Lord Venkateswara. There is a secret village, located approximately 23 Kms from the temple. Outside people are not allowed into that village. The people are said to be living with strict practices and tradition. This secret village supplies all fresh pooja(worship) items such as flowers, ghee, milk, bilwa leaves, banana leaves, butter, etc. Lord Balaji’s hair is good-looking, silky smooth, and never tangles all the time. It is believed that Lord Balaji has natural hair. Oil lamps are used in worshipping Lord Balaji. These oil lamps are to be found in front of the deity of the Lord Venkateswara. The miraculous thing is that these lamps never get put off. No one knows the occasion when these lamps were lit up for the first time. It looks like that these were lit up thousands of years ago and will stay the same everlastingly. Do you want to visit this interesting sacred Temple? If yes, then call us immediately! We at Sri Balaji Darshan Travels, assist you to visit Tirupati Temple by organizing complete one day trip to Tirupati from Chennai daily. Daily Chennai to Tirupati packages includes complement breakfast and lunch at best hotel.